The Barcelos Rooster is considered to be the unofficial symbol of Portugal. You can find this emblem in many forms in every local shop and especially gift shops. This national symbol is mostly found in its typical ceramic from as well as embroidered on towels and aprons. Other souvenirs include key-chains, paperweights and other popular tourism gifts. 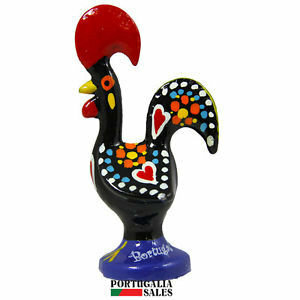 The Barcelos Rooster is always vividly colored, and is said to be the embodiment of the famous Portuguese love of life. The legend takes place in 15th century Barcelos. Its citizens had become upset by an unsolved crime that was so terrible that it had the citizens in an alarming state. An impoverished pilgrim had been passing through Barcelos, which was a neighboring city to his in order to fulfill a promise he made during a Pilgrimage to Santiago de Compostela. Despite his explanation for being in Barcelos, he was still arrested and condemned to hang. He refused to go quietly and asked to be taken in front of the judge who sentenced him to death. The authorities granted his wish, and brought him to the magistrate’s house while he was having a banquet with friends. He affirmed his innocence, and swore the proof of his innocence by pointing to a cooked rooster and said that the rooster would crow at the hour of his hanging as proof. The statement caused a large amount of laughter and mockery. The judge ignored the statement of innocence, but still set aside the rooster and refusing to eat it. When the time for judgment came, the pilgrim went to the gallows to accept his punishment. As he was being hanged, the roasted rooster appeared and stood up on the table in front of the crowd and crowed just as the pilgrim predicted. The judged realized the mistake he had made and rushed to save the pilgrim. The cord was not correctly tightened and was able to easily be saved from his death sentence. Later, the pilgrim would return to Barcelos. He sculpted a cross in honor of the Virgin Mary and St. James, who he felt was responsible for saving him with the miracle of the rooster. Today, this cross is referred to as the Cross of the Lord of the Rooster. This statue is still in existence in the Archeological Museum of Barcelos. The story of the legend can vary depending on the telling, although the main story about the roasted rooster declaring the pilgrim innocent. One variation claims that the pilgrim was a guest of the landowner and his banquet, which was where silver was stolen. Another telling, the pilgrim was a guest at a local inn, and the owner of the inn falsely accused the pilgrim of the crime as a result of his own greed. In some legends the pilgrim is from Galicia, while others do not. In another story, there are two pilgrims that are father and son, and the son was convicted of the crime and the father called upon the rooster to crow. Whichever telling of the legend that you hear, the Barcelos Rooster is a common sight while you are visiting Portugal, with numerous souvenir choices emblazoned with its symbol. Now that you know the significance of the symbol, you can add this piece of Portugal pride in your home after visiting this beautiful country.